Adapted by permission from "Learn to Spin Cotton" by Irene Schmoller with Cotton Clouds. Pima Cotton was developed in Arizona for its length, strength, and durability. It is more silky and more lustrous than short staple cotton and much easier to spin on a spindle. Before you begin spinning, tease the cotton fibers in your hands by fluffing them up - pull them between your fingers, pulling on the fibers until you almost but not quite pull them apart. Keep the fibers in one mass - about a palm's full. The more care you take in preparing the fibers at this stage, the easier they will be to handle when spinning. Before you begin using your spindle, hold a mass of cotton you have teased and fluffed in one hand. When holding the cotton fibers it is important not to clutch the cotton tightly, but to hold it loosely so that when spinning, the fibers can flow from your hand. With the other hand pull on a few fibers, drawing them out of the mass. Begin twisting by rolling the fibers in one direction between your fingers, making sure to hold onto the twist and not let it go. Keep drawing and pulling out from the fiber source and twisting in one direction. See!! You have spun some yarn!! Practice until you have the "feel." Spinning is known to nearly all people in the world. The twisting of fibers between the fingers is the oldest method of spinning. Once, this was discovered and used, a shaft - weighted at the bottom with a whorl - replaced the fingers. This added a steady, rhythmic momentum to the twisting of the fibers into yarn, thus increasing spinning efficiency. Tie your spindle with a piece of lead yarn. The yarn should spiral up the shaft to the pointed tip, and maintain this position throughout spinning. When winding spun yarn onto your spindle, develop a cone by winding more yarn around the base than the top. This will keep your spindle balanced! Sitting on the ground, or in a comfortable position with the spindle resting on a smooth surface, support it at a 45 - degree angle in the space created by your thumb and index finger. Bring the shaft of your spindle forward to the tip of your fingers and give it a good hard twist, much like you would a toy top. (Always twirl in the same direction.) The more momentum you give your spindle, the faster and easier it will be to spin a yarn. As the spindle twirls, let it fall back into the space created by the thumb and index finger where it will maintain a steady spin. PRACTICE SPINNING YOUR SPINDLE! Overlap two to three inches of the lead yarn onto the cotton fibers. Twirl the spindle until the twist travels up the lead yarn and into the fibers. Pull gently on the fibers by pulling your fiber source hand back away from the spindle about three to four inches, and pinching the spindle shaft with the other. Twirl the spindle again adding twist to the connection. This is usually the most difficult step in spinning. If the connection breaks apart - tie a knot to hold!! 2. 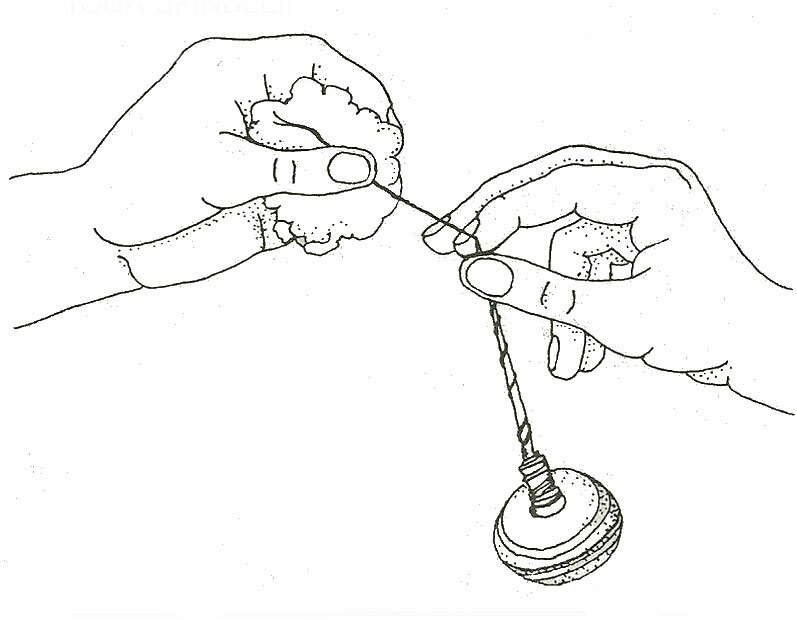 Pinch Spindle and Yarn at its tip with thumb and index finger. 3. Pull back gently with your fiber source hand, allowing the fibers to flow from the mass. You will see the "Magic V" of spinning where fiber flows to the twisted yarn!! The built-up twist in the yarn will be released and travel up into the fibers once you pull back, thus in essence the spindle dues the work of spinning the fibers; you merely allow it to happen! 1. Wind yarn off your spindle into two equal sized balls. Place each ball in a separate container (jar or basket, so they will not roll around and tangle). 2. Bring the ends of each ball out and connect to the spindle. 3. Spin your spindle IN THE OPPOSITE DIRECTION from which the yarns were spun and the two threads will become one two-plied yarn. Plying adds strength and regularity to your 100% Cotton yarn! Now that you have spun a length of cotton yarn you can continue with patience and lots of practice to develop your spinning skills. The more you spin and the more regular your yarn becomes you will begin to ask, "Now what can I make with this cotton yarn?" Your two-plied cotton yarn can be crocheted, knitted, or woven into scarves, socks, shirts, skirts and a variety of items in the same manner you would use any other yarn but to the advantage that it was created by you and its unique irregularities are a record of your hand in its creation and it is 100% Cotton - cool, comfortable and chic!